Our product range includes a wide range of jigger dyeing mc automation system. 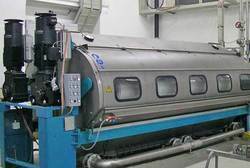 our jigger Drive system is a drive system for jiggers (fabric dyeing machine), it is based on the latest generation ac drives of parker hannifin AC30 specalized for winder application, our system operates without a sensor for fabric tension control. Furthermore costs for maintenance and long machine standstill times during overhauling of conventional drives can be saved. our system consists of a complete package, containing motors, gear boxes, inverters and machine controller. All functions are already included in the control software. All components are already pre-programmed and adapted to each other. Special control functions like control of fabric tension and control of fabric speed are already integrated in the control software. The use of our system simplifies machine construction, ensures production safety and cuts costs for repair and maintenance in production. Looking for JIGGER DYEING MACHINE AUTOMATION SYSTEM ?